“You’re going to get lost, it’s part of the experience”. That’s what you’ll hear from past visitors to Venice, Italy. Sure enough, while exploring the maze that is Venice, we all get lost, in more ways than one. It’s not particularly easy to imagine a city built on water. A place where canals are used for daily transport and hotel managers welcome guests on moorings instead of driveways. Venice is situated in the middle of the Venetian lagoon, around 3 km from the mainland. From the airport, which is on the mainland, you hop into a water taxi and head out over the Venetian lagoon, towards the floating city. The taxi driver, or captain, seeing that it’s a boat, snakes through the city’s canals, dodging gondolas and ducking overhead bridges, eventually dropping you off at your hotel’s front door, which is essentially a mooring. It’s all very surreal. Venice doesn’t seem real at first. Some describe it as an elaborate film set suspended in water. Others say that Venice is half fairy tale and half tourist trap. Todays Venice might be unrecognisable to the likes of Ernst Hemmingway, Lord Byron, Charles Dickens, Casanova and Goethe, some of its most famous inhabitants from days gone by. The city has become a mass tourist destination, with millions of visitors flocking to its shores every year. Queues are long and access cards to museums and popular landmarks can be expensive. But that’s what it’s like in just about every city in Europe. There is something special about the place that you simply cannot put your finger on. This “magic” is what brings visitors back for another gondola ride, another lazy lunch on the canals and another sunset over the Venetian lagoon time and time again. To sufficiently describe Venice in all its wonder is almost impossible, but luckily a picture tells a thousand words. 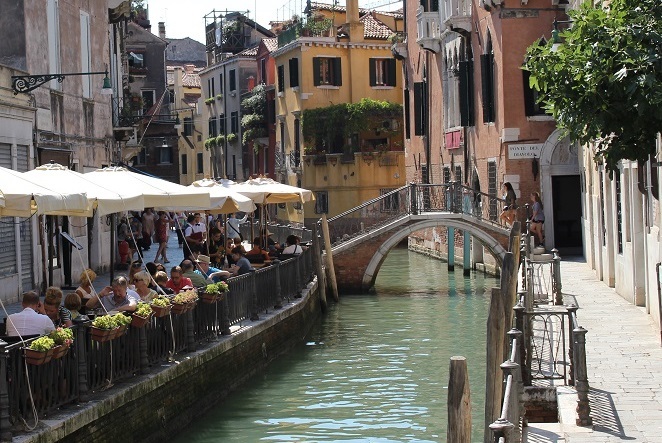 We have chosen 10 images that shows different scenes in Venice. Hopefully you’ll get lost in the beauty and “magic” of Venice. Water taxis, gondolas, barges and waterbuses share the waterways in Venice in what can only be described as organized chaos. 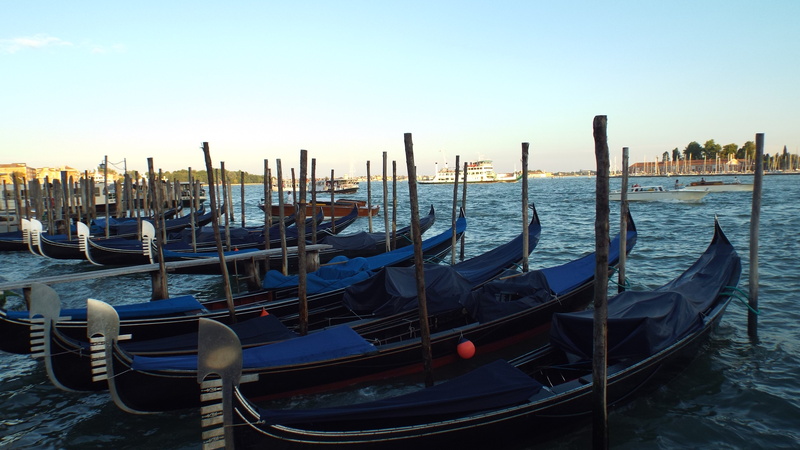 Boats and gondolas move at a snail’s pace, which adds to the relaxed atmosphere of the city. The Grand Canal is Venice’s main water traffic canal that runs from north to south in an inverted-S shape. The images above and below show the southern part of the canal where it opens up to the Venetian Lagoon. Gondola rides in this area are quite expensive, starting at €80 for a 20 minute ride. The above image shows the main entrance to the elegant Hotel Cavalletto. 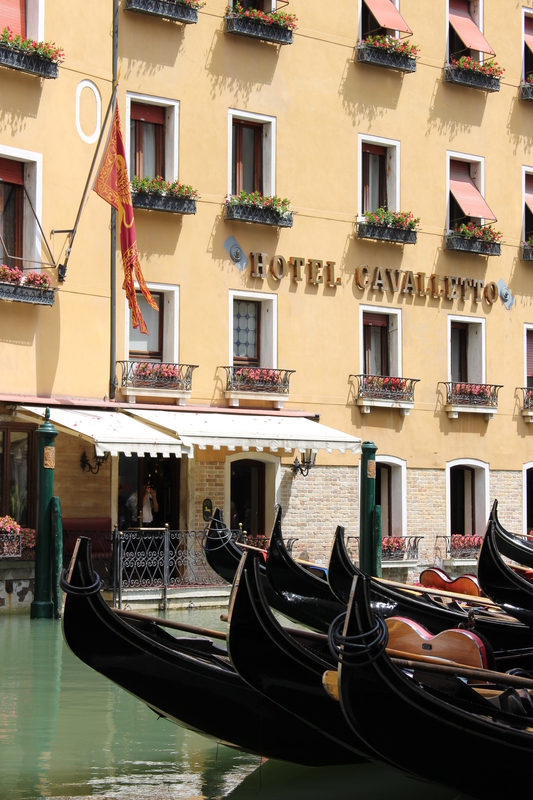 The hotel is situated at the Bacino Orseolo gondola station, one block behind San Mark’s Square. When you open the windows of your room you can hear gondoliers serenading their patrons. Being a tourism mecca, Venice does get a little crowded and noisy. 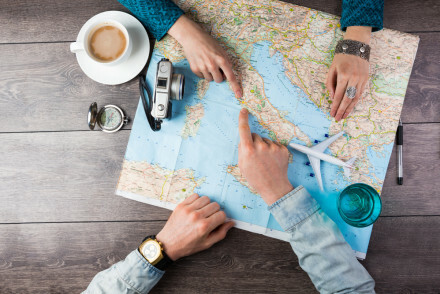 Always ask your travel agent for a hotel that is a little removed from the main shopping areas to avoid high noise levels. Something like the Duodo Palace hotel is absolutely perfect. 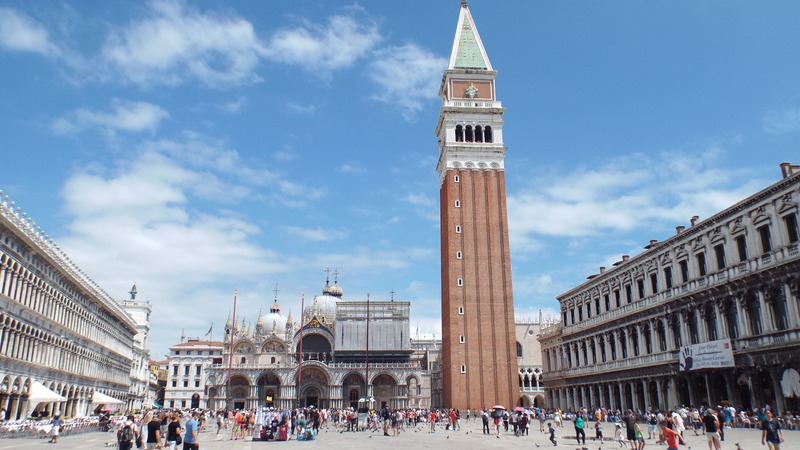 St Mark’s Square with St Mark’s Basilica and the bell tower is the city’s second most popular attraction. The canals are of course Venice’s main draw card. The Basilica is open to the public free of charge, you can however expect to queue for 45 minutes to an hour. For €8 visitors can ascend to the top of the 98.6m high bell tower. We would recommend that you do this around sunset, when the queues are shorter and you get to experience the sun setting over the city. History lurks around every corner in Venice. Cafè Florian on St Mark’s Square provides visitors with the opportunity to be part of history. Cafè Florian first opened its doors in 1720. It is the oldest coffee house in Europe. Lord Byron, Casanova, Goethe, Ernest Hemingway and Charles Dickens were all regulars at Cafè Florian. 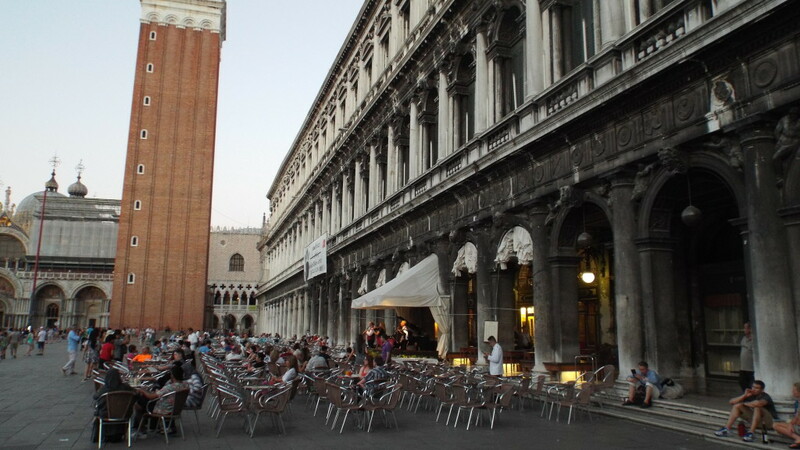 You can sip coffee while looking over St. Mark’s Square and be part of history. At €8 a pop it’s quite expensive, but still highly recommended. The city is built on 117 small islands that are separated by canals and linked by bridges. The city’s location made it easy for traders to do business with the east, which made it a very wealthy and powerful trade centre. This money was used to build the city as we see it today. Venice is essentially a very elaborate labyrinth of medieval and renaissance style houses and palaces. This, of course, is what makes Venice so famous, and what differentiates it from every other city in the world. Gondola rides through the canals cost between € 80 and € 100, depending on the station. 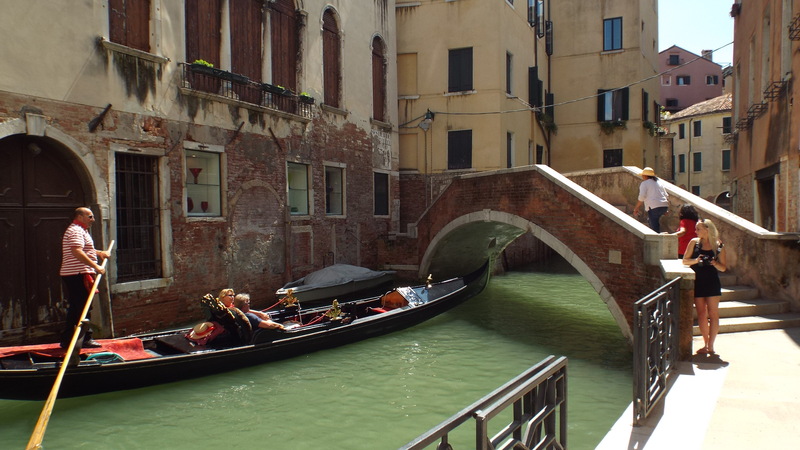 It does sound a little expensive, but these gondoliers aren’t amateurs. There are only 405 gondoliers in the city. Licences are usually passed on from one generation to the next or sold. Gondoliers do however make very good money. They have to; if you consider that a gondola costs around €15 000 and a licence around €150 000. 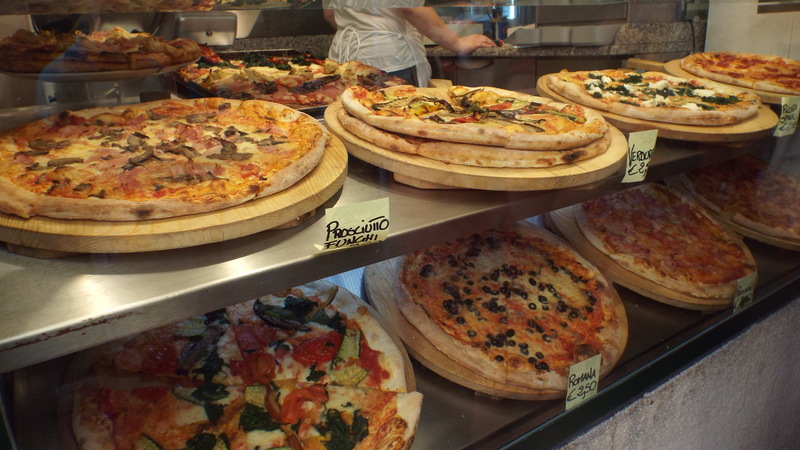 Pizza is not part of traditional Venetian cuisine, but it can pretty much be found around every corner these days. It’s the most affordable and most convenient way to have lunch. Plus it’s absolutely delicious. 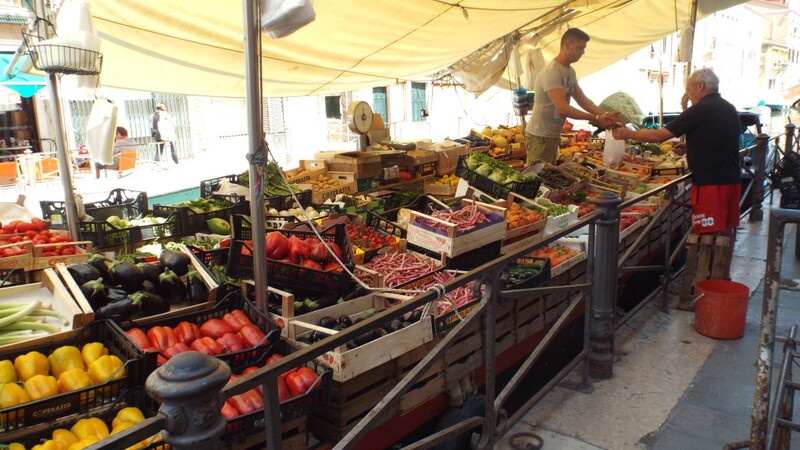 Risotto, pasta, polenta and seafood are among Venice’s most popular dishes. The city also has an endless number of gelato vendors. Walking the streets of Venice at night, with a cup of gelato in hand, might be the simplest meal that one can have, but it’s certainly the most enjoyable. When you first arrive in Venice the sheer number of tourists can be quite overwhelming. We arrived in Venice almost 24 hours after setting off from Cape Town. The water bus dropped us off at St. Mark’s station and we had to find our hotel in the maze of the city’s backstreets. Carrying our bags and dodging hundreds of people while trying to find our hotel was stressful and tiring, especially after such a long journey. But once we’d settled in and rested a little, we started to appreciate the city for what it is, a true marvel. 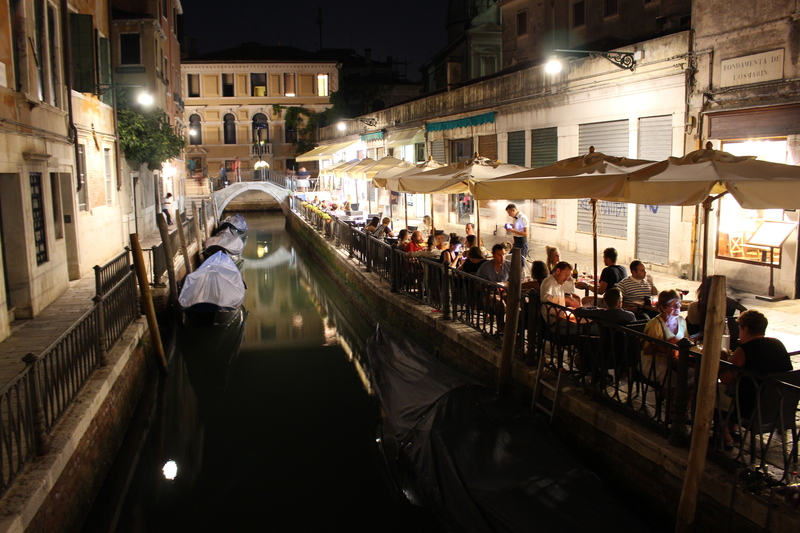 It is advisable to spend at least three nights in Venice. 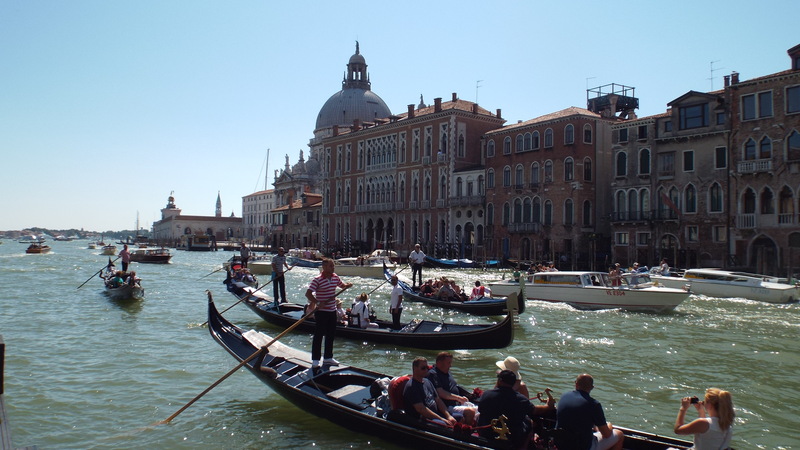 You’ll have enough time to visit all the important landmarks and still have time to stroll down the backchannels or have a gelato next to the Grand Canal while the sun sets. Those are the most memorable moments of any trip. Gondola rides are expensive. Don’t feel that you have to do them just because you’re in Venice. They are worthwhile, don’t get me wrong, but if you feel that you’ll rather spend the € 80 or € 100 on a long lunch on one of Venice’s canals, then do it. Don’t fall for the clichés while travelling. Create your own story. Venice is waiting for you to get lost in its magic.